Here are reviews of some of the most important movies about Kenya that have been made during the last decades. Especially in Europe, Africa was rediscovered somewhat during the last decade. The number of movies about Kenya has risen considerably. A real-life movie about the real life of a Swiss woman (Corinne Hofmann) who, while traveling in Kenya with her boyfriend, falls in love with a Masai warrior and goat herder, who’s living in a tiny traditional village in the middle of nowhere. They marry and she joins him in his traditional (poor, hard and uncomfortable) life style. However, he gets more and more possessive and aggressive, accusing her of adultery and witchcraft. She has to flee with their daughter to Switzerland. Some details have been changed: the brown-haired and sun-tanned Hofmann is played by a beautiful platinum blonde in the movie, and while the real husband is from the Samburu tribe, the movie husband is from the Masai who’ve traditionally been the object of much Western female fantasizing. 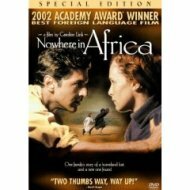 Still, one of my favorite movies about Kenya. 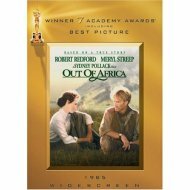 “Out of Africa”, the most succesful of all movies about Kenya, is about the real life of Karen Blixen (pen name Isak Dinesen), the Danish author who traveled to Kenya in 1913 to be with her unfaithful German husband to run a coffee farm. To her surprise, she falls in love with the country, and with a British adventurer Denys Finch Hatton (played by Robert Redford). They have a passionate relationship but he loves his freedom too much to marry her. Then he dies while his small plane crashes. Her struggling farm is destroyed in a fire and goes bankrupt, and she discovers her husband passed syphilis on her. She returns to Denmark in 1931, never to return to Africa again. The movie, that won several Oscars, is full of beautiful images of Kenya, and is a rich portrait of love and loss. A third real-life movie about the wealthy Italian socialite Kuki Galmann, who accepts a marriage proposal from a man she barely knows, and moves to Kenya to run a cattle farm. With her husband always on hunting trips, she has to deal with the tough life on her farm all by herself. Poachers who kill their cattle, devastating storms, and the death of first her husband (in a car accident) and then her only son (through a snake bite) take their toll. She develops a real love for the country and it’s people, and she becomes a nature conservationist. Critics have not received the movie well, and indeed, the script has it’s weak sides. Still, I though it was an interesting movie about the power of a woman who, through the love for her new homeland, overcomes personal tragedy. A German movie (available with English subtitles) loosely based on the true story of a Jewish family who leave Nazi Germany in 1938 and start a farm in Kenya. They want to return to Germany, but can’t and have to learn to live with the situation. While dad is discriminating against the native Kenyans just like he was discriminated himself in Germany, and mum is resisting their new future in Africa in anyway she can, the daughter opens herself for the language and culture of Kenya. Based on the autobiography of Stefanie Zweig (the daughter), but many fictional elements (such as the family situation) were introduced in the movie. A movie about family, love and adapting to forced new circumstances. It won the 2002 Academy Award for best foreign language film. 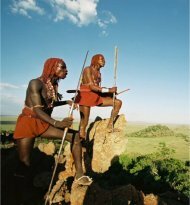 A movie in the traditional Masai language (with English subtitles) and populated entirey by real-life Masai from Kenya. It’s about the struggles of a Masai village to bring the rain back in their village that’s devastated by drought. 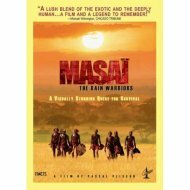 In order to bring back the rain, a group of very young Masai warriors – teens, basically – set out to kill a mystical lion as a ritual. They face severe problems as they are untrained and inexperienced, and struggle with burning questions: Does the lion actually exist? And if so, will killing him bring back the rain? 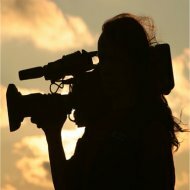 The French movie director, Pascal Plisson, is a devoted nature documentarian and it shows in the movie. By the way, I discovered a pattern in the first 3 movies on this page: they are all based upon true autobiographies written by European women who went to Kenya where they had to survive hardship and tragedy, in all cases through men they love but who cannot be trusted or depended upon. Don’t know if this means anything, but it was pretty striking. If you buy a DVD, make sure you have the right one. First, unless you have a DVD player that works with DVDs from all world regions, you must buy a DVD with the right region. Here’s explanation. Also, check the language and/or the subtitles of the DVD you’re interested in. Same goes for video’s, of course.